WOW can't believe it's finally here. Where exactly has the year gone? I hope you are all having a wonderful holiday season, whatever your holiday that you are celebrating is. Are we ready for a brand new year? I know I am! I found tonight's cocktail at the freefunchristmas website. 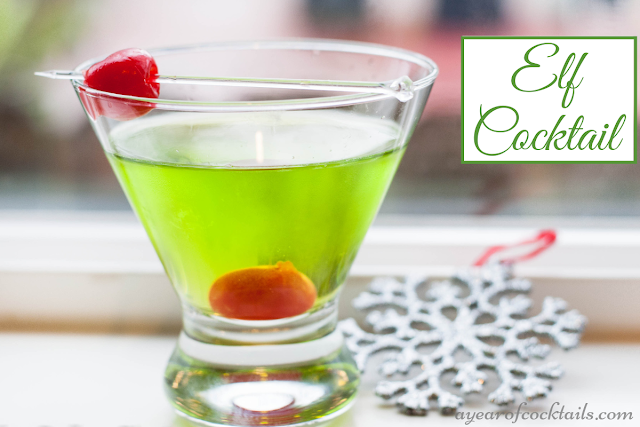 I love elves and thought this might be a fun cocktail to have on Christmas.....WRONG! Oh well, you win some and you loose some. This one was too sweet (I hear those of you gasping that have been with my since this beginning of my adventure), and the flavors trick you on the first sip making you "think" that you may just almost like this cocktail, then BAM you take a second sip and you know what you knew all along, yuck! In a shaker, add ice and all of the ingredients above except for the cherries. Shake and strain into a martini glass. Garnish with cherries. I hope you are all having a wonder holiday season!